Eliminate the costly exhaust manifold cracks prevalent in the factory exhaust manifold. The aFe Bladerunner exhaust manifold for the popular 5.9L Dodge Ram Cummins sets the new standard. Constructed out of cast 304 stainless steel with a reinforcing rib for strength along the flange and ultra-thick wall flange at the port. The Bladerunner exhaust manifold outflowed the factory exhaust by 23% improving exhaust flow, performance and throttle response. 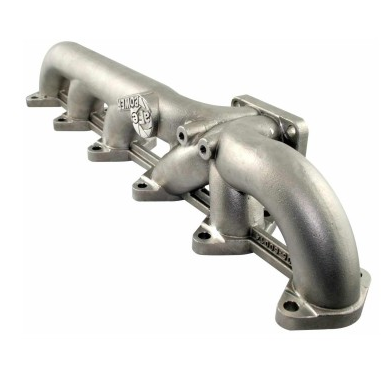 This manifold also features 2 EGT probe ports, thick wall design for increased strength (0.25" vs 0.15" for the stock unit), matched ports and has a merged runner design to maximize maximize exhaust flow. Once you install this awesome exhaust manifold, you will feel improved turbo spool up times, improved throttle response and performance. This exhaust manifold is 50-state legal for 2003-2007 models (CARB E.O Number D-550-9).